Clayton Doley's Organ Donors Tension! 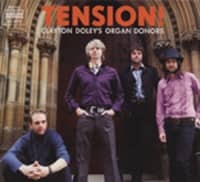 Clayton Doley's Organ Donors: Tension! (SUNDAZED) 9 tracks - digipac Australia's preeminent instrumental combo the Organ Donors, driven by seasoned keyboard virtuoso Clayton Doley's mighty Hammond organ, delivers an unstoppable explosion of deep-grooved psychedelic-soul soundscapes. The resulting album could easily mistaken for a rare vintage gem unearthed from the vaults of a long-forgotten American R&B label, suggesting a parallel-world all-star jam between Jimmy Smith, Jimi Hendrix and Booker T. & The MG's. This stellar debut is now available to listeners worldwide on a compact disc from the soul fanatics at Sundazed Music! Artikeleigenschaften von Clayton Doley's Organ Donors: Tension!